Short for Excellence in Sports Performance Yearly Award, the ESPYS are the equivalent of the Oscars but for the sports world. With a celebrity guest list that includes a mix of professional athletes, Hollywood stars, and chart-topping musicians, the ESPY awards are always a glamorous affair. The 2018 ESPY awards, held on Wednesday, July 18, 2018, in Los Angeles, was no different. As expected, the red carpet was filled with extravagant outfits, flashy jewelry, and plenty of luxury watches. And that was from the men! Of course, this being a celeb-packed event, there were plenty of Rolex watches on show too. So, with that, here are some Rolex watches that we spotted at the 2018 ESPYS Awards. Fresh from his 2018 NBA Championship win with the Golden State Warriors, JaVale McGee will be joining the LA Lakers roster along with LeBron James for the next season. COMMENT 🤙🏽 IF YOU BOUT THEM POSITIVE VIBES! Known for his unique style, JaVale McGee did not disappoint on the red carpet of the ESPYS with a pair of rose-patterned pants and matching suit jacket topped with a red Gucci fanny pack. Contrasting with his fashion-forward outfit was his classic yellow gold Rolex Day-Date President watch on his wrist. 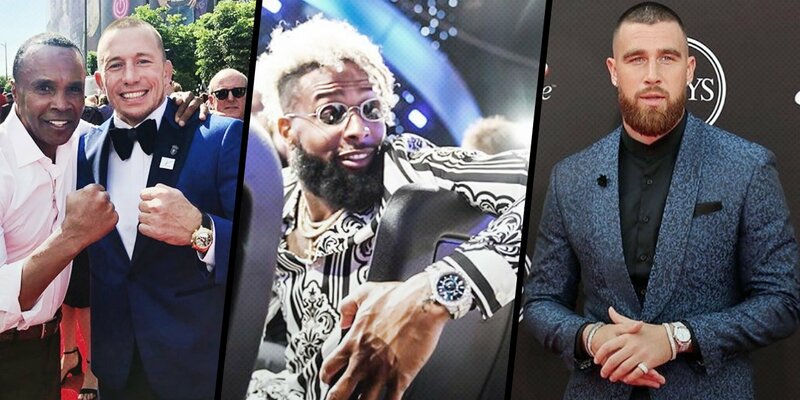 New York Giant’s wide receiver, Odell Beckham Jr., is no stranger to taking fashion risks and his outfit choice at the 2018 ESPYS was right in his wheelhouse. Along with his black and white print shirt and shorts combo, oval sunglasses, and plenty of jewelry around his neck, the NFL player also had on an iced-out Rolex Sky-Dweller gleaming on his wrist complete with a vibrant blue dial. Canadian mixed martial artist, George St-Pierre, or GSP to some, indulged in a photo op on the ESPYS red carpet with boxing legend, Sugar Ray Leonard. Getting some serious knowledge from the great, the one and only @Sugarrayleonard yesterday! While doing the pre-requisite boxer’s pose, we spotted a shiny yellow gold Rolex Daytona on GSP’s wrist. And rather than a matching yellow gold bracelet, his Daytona comes with the lighter black leather strap. Travis Kelce, tight end for the Kansas City Chiefs NFL team, also brought his fashion game to the ESPYS with his floral patterned navy suit and black shirt combo. However, it was his wrist that grabbed our attention since it was home to a stunning platinum Rolex Day-Date President with the iconic ice blue dial. Figure skater Adam Rippon took home a bronze medal for Team USA at the 2018 Pyeongchang Winter Olympic games but it was perhaps his win at the last season of Dancing with the Stars that made him an even bigger household name. Never one to shy away from the spotlight, Adam Rippon made sure he stood out on the ESPYS red carpet with an embellished white jacket. What’s more, as always, the Olympian had his favorite two tone Rolex Datejust watch on as well. In contrast to other celebs that night, Seattle Seahawks’ quarterback, Russell Wilson, kept it fairly conservative fashion-wise for the evening with a dark blue and black getup. The Wilson’s stole the show yesterday at the #Espys — suitable looks for the evening! However, with his rolled-up sleeve, Russell Wilson’s two tone yellow gold and steel Rolex Submariner was on full display. We especially love that the blue dial of the Super Bowl champ’s Submariner matched his tailored jacket. Yet another athlete that rocked a bold pattern for the awards was LA Lakers’ power forward, Kyle Kuzma. To accent his teal snakeskin-print tuxedo jacket, Kyle Kuzma opted for a yellow gold Day-Date President watch. The precious metal luxury Rolex watch also flaunted a sparkling diamond-set bezel surrounding the black dial. From Day-Date to Datejust, Submariner to Sky-Dweller to Daytona, it’s clear that a Rolex watch is the must-have luxury watch for any red carpet event.